Good afternoon Effort. We will celebrate communion together this Sunday. Communion is, among other things, a celebration of the unity of the fellowship that God has brought together (1 Cor. 10:16-17). This fellowship that God has gathered together is then sent out to bless the community. It is our tradition to practice this “sentness” on Communion Sundays by collecting items for those less fortunate in our community. Please bring non-perishable food gifts to help restock the MACAA Food Pantry, or clothing for the Clothing Closet in Charlottesville. There are collection bins in the lobbies of the Sanctuary and Family Life Center for you to leave your donations. 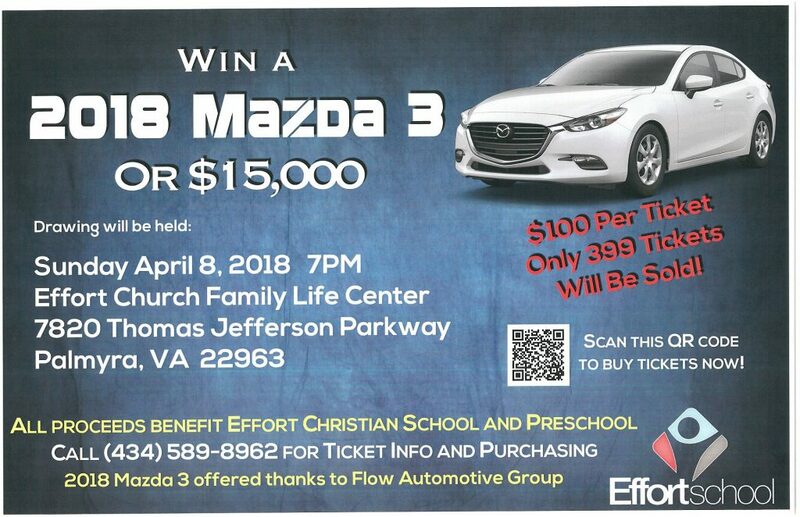 Win a 2018 Mazda 3 or $15,000. Tickets are available at the church office, $100 each. Only 399 tickets will be sold. The Drawing will be held on April 8th at 7:00PM in the Family Life Center. You need not be present to win. All proceeds will benefit the Effort Christian School and Preschool. Tickets sold in VA only. Virginia Sales Taxes, Virginia Vehicle Titling and Registration fees must be paid by the winner.